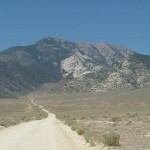 In last week’s column, I described the first half of my ascent up a little-known but impressive peak in the Stansbury Mountains. I call it Hickman Head, and it’s a giant limestone knob perched on top of a high ridge between Vickory Mountain and Deseret Peak. At 10,018 feet above sea level, it’s one of the highest peaks in the range and possibly one of the most difficult to climb. I started hiking at the new trailhead in Hickman Canyon at about 6 p.m. and was halfway up the ridge an hour and several miles later. My hiking companions decided to head back down at this point, but after two prior failed attempts, I was resolved to reach the summit, even in the dark. To me, darkness is just another state of reality and even when visibility is decreased, I don’t always allow fading light to end my explorations. By 7 p.m. shadows from the Stansburys were creeping across Rush Valley and it was getting darker in the pines. The ridge I was on was so steep it required careful consideration in some areas to negotiate obstacles. Even in this steep and rocky area, I noticed small, white, snail- like Cephalopod shells in the black soil and how the heavy weight of dozens of pine cones caused a Douglas fir branch to droop. I then heard the click and smack of rocks falling on each other and noticed three mule deer on the slope. As I climbed, I knocked off a rock and it fell hard against the rocks below, creating a bright orange spark. It made me wonder if animals knocking off rocks ever start forest fires. I continued clawing my way up the slope and realized that I was fully committed now; to descend by this route would be too dangerous in the dark. I was racing the sunset to top the ridge so I could see the sun dip behind the Cedar Mountains to the west. I finally reached the top of a forested finger that extended east off the main summit ridge when I made a startling discovery. I found a camp up there in the pines where a fire ring had been carefully put together, platforms for tents had been leveled and in the trees were about 10 15-gallon blue plastic barrels for water storage. I noticed a tin coffee pot, hand saw and a bunch of bottles full of water. It looked to be a leftover camp from fire fighters who fought the Patch Springs wildfire in 2013 that burned the west side of the Stansburys. It must have required aviation to get these items up this high and I thought it unfortunate they were left behind in the wilderness. I continued up to the ridge top, where I could see down into Skull Valley and across to the Cedar Mountains where the sun was disappearing in a spectacular orange finale. Elevation at the ridgetop was 9,649 feet. It is a lonely feeling when you have completed two hours of brutal hiking to reach a remote ridgetop as the sun is going down. As luck would have it, a large, white, perfect full moon was rising at the same time, which eerily yet beautifully lit the landscape. I could now see Hickman Head summit, which is not visible from the east until you reach the ridgetop. I was disappointed to see that it was another half mile or so to the south and some of the terrain was heavily forested. I had come too far to fail now. I pushed on and soon discovered another deserted camp at the edge of the burn in the half-light. It looked like whoever had been there just left before I arrived. The sight was creepy. I hollered toward the tents and when I was sure no one was there, I passed by and hiked through the trees to a minor summit and then west to the top of Hickman Head, where I arrived at 8:14 p.m.
What an incredible view. I stood at the edge of the west- facing cliffs and surveyed the scene. It was totally silent in the pale moonlight. There was no wind and when a coyote bawled somewhere off in the bottom of Dry Canyon, it was distinct. The summit cliffs seemed much larger than what I was expecting and were impressive. I felt a pang of regret that I had left my food in my truck and had nothing but water on the summit. I surveyed the scene for a few moments, appreciating the stars and mountain night, and then turned my attention to the descent. There was no way I was going to tackle the steep slope I ascended in the dark, so I followed the summit ridge north to find a good finger ridge to follow down to the Stansbury Front Trail. I said a quick prayer for a safe descent, which is always a good idea, and then headed down. It seemed easy enough but the ridge I committed to turned out to be rocky with sharp exposure in some areas and an overgrown steep mess in others. I knocked off a few rocks and they fell for a long time before I couldn’t hear them tumble anymore. I precisely chose each step, foothold and handhold in the moonlight and wasted an hour crossing the ridgetop. Time wasted safely traversing a ridgetop is not wasted time, however. I finally found a connecting ridge that was extremely steep but free of cliffs and obstructions. I descended this ridge in the half-light with no flashlight dropping 1,873 feet in about seven-tenths of a mile. 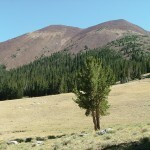 I was happy when I finally reached the base of the ridge and bushwhacked my way to the Stansbury Front Trail. The time was 10:20 p.m. I followed the trail south, in and out of a few draws where I passed through some aspen woods, which were a pleasure in the moonlight. The trees’ shadows seemingly painted the ground in the chilly stillness of the mountain night. In the black bottom of a draw the only sound was a stream trickle where the cold forest air smelled good. As I emerged from a group of trees, I spooked a group of mule deer. I then left the trail and descended a forested ravine that deposited me on the canyon road. I arrived back at the trailhead at 11:20 p.m. I had covered nearly eight miles without a flashlight with an elevation gain of 3,675 feet from trailhead to summit. 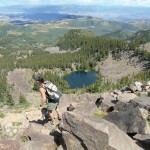 This was an incredible adventure into the wild heart of the Deseret Peak Wilderness Area that I will never forget. I have accustomed myself to hiking in the dark over several decades and unless you are comfortable and competent doing so, I recommend you plan your hikes when the sun is up. If you decide to visit this area, take plenty of water. Trail travel is easy and safe, but if you leave the trail and climb the ridges it can be treacherous. Make certain that you know the limits of your capabilities and take a good map. Let someone know where you are going and when you intend to return. If at all possible, avoid hiking alone. 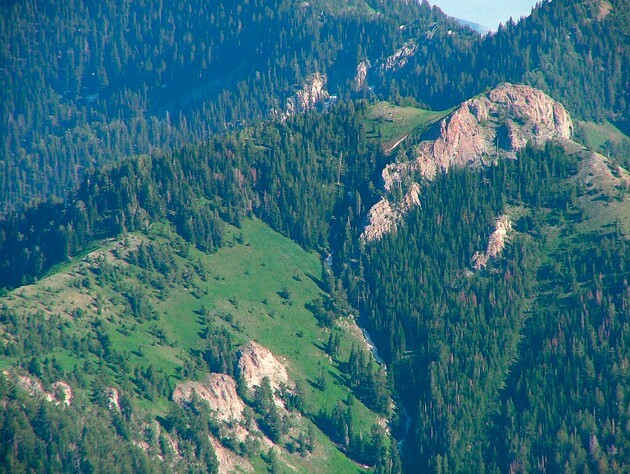 For more information on this area, visit fs.usda.gov/main/uwcnf/maps-pubs and look at the Salt Lake Ranger District Map that covers the Stansbury Mountains. The Tooele County Trails website is a good resource as well. 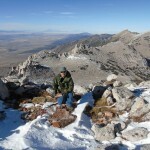 It can be viewed at www.tooelecountytrails.com.